Highly variable sod-forming perennial with extensive creeping rhizomes and stolons, to 0.4 m tall. Bermudagrass is commonly grown as durable turf or forage in tropical to warm temperate regions nearly worldwide. Numerous hybrids and cultivars have been developed, including some that tolerate cooler conditions. Because of its vigorous creeping habit, bermudagrass is a noxious weed in many situations where warm season moisture is ample. Contact with plants can cause dermatitis in sensitive individuals, and the pollen is a common allergen. Mature bermudagrass pastures have occasionally been implicated in livestock photosensitization or neurological syndromes, especially in late fall or early winter. Toxic symptoms may be due to molds or fungi sometimes associated with bermudagrass. 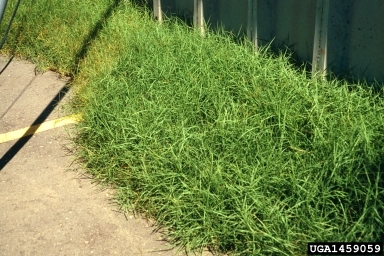 Bermudagrass utilizes the C4 photosynthetic pathway. Biology & Spread: Reproduces vegetatively from creeping rhizomes and stolons and by seed. Rhizome and stolon fragments disperse with landscaping and agricultural activities, and soil movement. Re-growth from fragments is greatest from soil depths to 5 cm (2 in). Seeds disperse with water, soil movement, agricultural and landscape machinery, as a commercial seed impurity, in livestock feeds and bedding, and with other human activities. Seeds germinate spring through fall when temperature and moisture conditions are favorable. Some seeds survive up to ~ 3-4 years under field conditions. Hybrids and other Cynodon species seldom produce viable seed. U.S. Habitat: Disturbed sites, gardens, agronomic crops, orchards, turf, landscaped and forestry areas. Grows in areas that are irrigated or receive some warm season moisture and on most soil types. Tolerates acidic, alkaline, or saline conditions or limited flooding. Temperatures below -1? C (30? F) kill above ground parts. Optimal growth occurs when daytime temperatures are between 35-38? C (95-100? F). Grows poorly in shade. African bermudagrass [Cynodon transvaalensis Burtt Davy][CYNTR] and stargrass [Cynodon plectostachyus (Schumann) Englem][Bayer code: none] are similar but uncommon warm climate perennials. Unlike bermudagrass, African bermudagrass has 1-2(3) inflorescence branches ~ 1-2 cm long that typically point downwards (reflex) at maturity, short membranous ligules, and blades mostly 10-30 cm long and ~ 1-2 mm wide with 3 primary veins. African bermudagrass grows along roadsides and on disturbed sites in the Sonoran Desert (Imperial Co.), to 100 m (330 ft). It hybridizes with bermudagrass and has been used in breeding programs to create many of the commercial bermudagrass cultivars. Unlike bermudagrass, stargrass lacks rhizomes (but has stolons) and has stiff-hairy blades 10-30 cm long with transparent membranous ligules ~ 1 mm long, infloresence branches arranged in 2-7 closely spaced whorls, scale-like +/- triangular glumes less than 0.3 mm long, and hairy palea keels. Inflorescence branches are typically curled at maturity. General: Persistent hand removal of rhizomes and stolons can eliminate bermudagrass from small areas. Tilling or discing as needed to expose rhizomes to sun-drying or freezing temperatures, or summer solarization in moist soil for 6 weeks can control infestations. Systemic herbicide is most effective when applied to non-water-stressed plants after flowering in summer to mid-fall, before plants go dormant. Mowing at a height of 5-8 cm (2-3 in) can help discourage bermudagrass spread among more desirable turfgrasses. Cleaning mowers and agricultural machinery after use in bermudagrass infested areas can prevent dispersal of rhizomes and stolons.